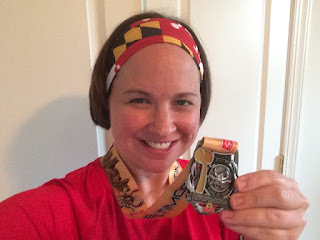 I was back and forth in the weeks leading up to The Baltimore Running Festival on whether or not to sign up for the 5K race. Ultimately, I decided to register for two main reasons. 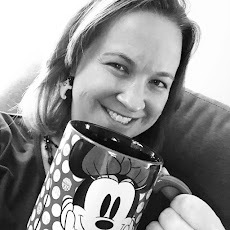 I hadn't raced since May 2014 when I became pregnant with my second child and I was in need of a "big time" race feel prior to the runDisney Wine and Dine Half Marathon in November. 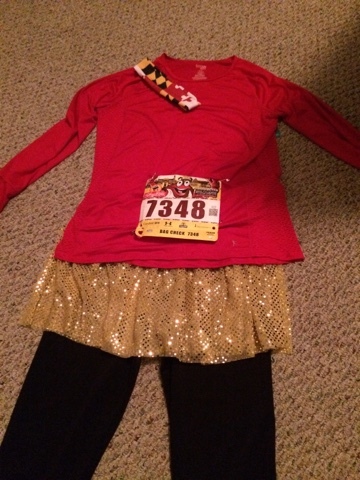 The Baltimore Running Festival 5K was a great experience and I was so happy that I made the decision to join the fun! If you're unfamiliar with race day, Baltimore features a Kids Fun Run, 5K, Half Marathon, and Marathon. This means that over 20,000 runners descend upon Charm City and take to the streets of Baltimore. Race organizers highly recommend public transportation, but that's not a good option from where I live in Maryland. The good news is that there is plenty of free parking in the lots surround M&T Bank Stadium and Oriole Park at Camden Yards. The 5K shared a start line with the marathon runners so I spent the morning with friends who were going to be running the marathon. The marathon runners began at 8:00AM and then those of us running the 5K started at 8:20AM. The start of the race was well organized and featured music, the mayor of Baltimore, and much more! I was glad for the chance to start a busy race as that was quite the experience. I know that I'm not one of the fastest runners out there so I was hanging out towards the back of the start. I was shocked how much bobbing and weaving had to take place over the first half mile until the crowd thinned out a little bit. The first mile and half was up Camden street and featured mostly uphill terrain. I had planned to run this race at my half marathon pace and kept to that plan during this part of the race. I've been training using Galloway intervals of 30:30, so it was a "choppy" 5K. After the block turnaround, the race proceeded onto Eutaw Street and it was truly "all downhill from here!" At this point, I was feeling like I had too much energy (is there such a thing??) and really felt silly running such short intervals in a 5K so I picked up the pace and ran the rest of the way in. 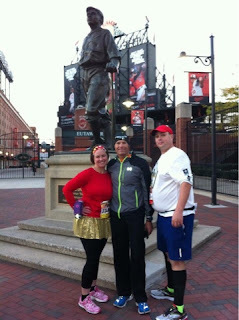 The finish of the race takes you through the Eutaw Street gates at Oriole Park at Camden Yards and into the parking lot of M&T Bank Stadium. One of the best aspects of the race was the tremendous support from the people of Baltimore. There were citizens literally everywhere along the course cheering us on, waving signs, and playing music in the streets. It was great to see the city come together for such a fantastic purpose. Between the well organized race, nice expo, great support, and bling for a 5K race, the Baltimore Running Festival was a fantastic way to re-enter the wonderful world of racing!